We continuously strive for excellence at right things right, first time, every time with zero defect. Bioscience Research Foundation (BRF) is an integrated discovery and developing Contract Research Organization (CRO). BRF, situated near Sriperumpudur, Chennai, Tamil Nadu, India, (40 minutes drive from Chennai Airport) was established on August 2010 and registered as a Trust. We are an autonomous and non-governmental body. We are a GLP certified laboratory (NGCMA - National GLP Compliance Monitoring Authority) in India in all of our departments. The facility is approved by Committee for the Purpose of Control and Supervision of Experiments on Animals (CPCSEA), confirm to its guidelines on developing reliable data while maintaining a healthy balance between animal ethics, welfare, and experimentation. BRF facility is also accredited by Department of Scientific and Industrial Research (DSIR), Government of India. BRF is Approved by Central Insecticide Board Registration Committee (CIBRC) by Ministry of agriculture & farmers welfare, Department of Agriculture, cooperation & Farmers welfare, Government of India BRF is approved by the National Service of Quality and Plant and Seed Health (SENAVE), Humaita. BRF is approved for Institutional Biosafety Committee (IBSC) by Department of Biotechnology, Government of India. Agrochemicals, Pharmaceutical products, Veterinary drugs, Industrial Chemicals, Food and feed additives. Full commitment to scientific excellence and regulatory ethics in research and development. Accredited by Scientific and Industrial Research Organization (SIRO), Department of Scientific and Industrial Research (DSIR), Ministry of Science and Technology, Government of India. Approved by CPCSEA (Committee for the Purpose of Control and Supervision of Experiments on Animals), Ministry of Environment Forest and Climate Change, Government of India. 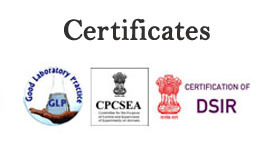 OECD GLP certified by National GLP Compliance Monitoring Authority, Govt. of India. Accredited by Scientific and Industrial Research Organization (SIRO) , Department of Scientific and Industrial Research (DSIR), Ministry of Science and Technology, Government of India. © 2016 Bioscience Research Foundation. All Rights Reserved. BRF was established to promote scientific research through biotechnology, with specific emphasis on agrochemicals, pharmaceuticals, health care and other industrial chemicals including bio-inputs and to facilitate the extension of knowledge in the field of regulatory affairs and Bioscience, especially for contract research. BRF family is an amalgamation of highly motivated, experienced, and young scientist who strive for excellence in their areas of research. The standards that we have set are on par with international norms to suffice the needs of our global partners. We have an ever growing Research and Development facility which is planning to have Memoranda of Understanding with various National Universities and Research Institutes which will encourage our scientist to update their knowledge and promote research activities helping in lifelong professional development. Full commitment towards scientific excellence and regulatory ethics in research and development. To achieve the highest level of efficiency in all our activities with quality & integrity of the common ingredients in all and continually striving to keep up with advances in the field of Biotechnology, Environmental Sciences, and Agro & Health Industries. As we move forward, we have certain milestones to achieve to support the ever growing needs of industry. AAALAC accreditation for the animal house facility. To standardize in vitro studies (Human skin model, membrane barrier) in safety assessment to reduce animal usage. Skin sensitization – local lymph node assay. In vitro mammalian cell gene mutation test. Mammalian spermatogonial chromosome aberration test. Establishment of the facility for tracing labeled radioactive compounds. Toxicokinetics and metabolism in labeled compound. To standardize fish embryotoxicity study. To standardize CTT and NTT research. Metal/Heavy metal analysis by ICPA. TCD – determination of moisture and evolved gasses in pesticide. NMR – Characterization and determination of new molecules.